It’s not the moniker most developers would relish being attached to their work, but in the case of the developers at Shiny Shoe, creators of Desert Bus VR, it’s entirely appropriate. On a very long and tedious drive visiting IndieCade, riding the I-5 between San Francisco and Los Angeles, most of us would be content with reading, playing video games or going quietly stir crazy. 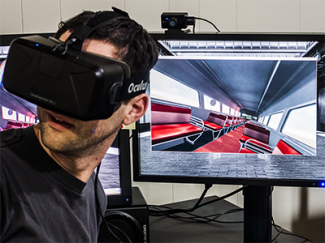 The developers at Shiny Shoe however clearly have more creative ways to waste time as they used the 8+ hours the journey to make a virtual reality game for the Oculus Rift. What’s more, it’s a VR remake of a infamous yet unreleased title named, appropriately, Desert Bus. 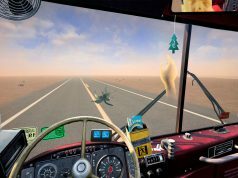 The original Desert Bus was actually a mini-game featured in a video game by famous illusionists Penn and Teller, and required the player to drive the road from Tuscon, Arizona to Las Vegas, Nevada at a top speed of 45 MPH, no traffic, no passengers, no scenery just open road and an erratic, swerving bus. If you somehow managed to complete this test of pointless endurance (this involved Penn and Teller after all), the player received a single point and was given the option to make the return trip. Compelling stuff I’m sure you’ll agree. “But why would anyone make such a game?” ..I hear you cry. Turns out it’s all for a very good cause indeed. You may or may not have heard, but the Desert Bus game spawned an annual charitable event aimed at raising money for the Child’s Play charity, a game industry charity dedicated to “..improving the lives of children with toys and games in our network of over 70 hospitals worldwide.” The live stream featuring multiple players attempting to complete the original Desert Bus, is live I write this and has so far raised a whopping $26,226 for the cause. 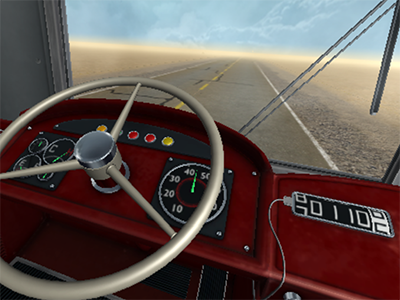 Desert Bus VR is designed to draw attention to the event. You can grab a copy of Desert Bus VR here, which is built for use on Oculus Rift DK2 headsets. The livestream can be visited here and of course you can donate right here. It’s great fun and for a good cause, and the folks Shiny Shoe should be applauded for turning their boredom towards helping such a great cause. Best of luck to all those involved in the live stream!